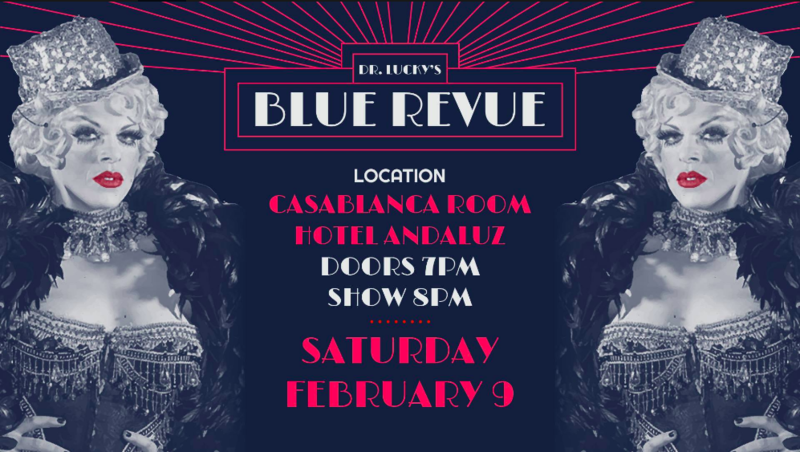 DR. LUCKY'S BLUE REVUE returns to the Hotel Andaluz for a series of the best and brightest nightlife entertainment the Land of Enchantment has to offer! STARRING World-Renowned Burlesque Legend Kitten DeVille (Los Angeles). Featuring Kisa von Teasa (Knoxville), Mena Domina (Sante Fe), Aluna Bun Bun (Sante Fe), Zircus Erotique (Sante Fe), Avery Taureaux (Albuquerque), and Lady Miss Peacock (Truth or Consequences, NM). Production Support from Kitten Violett Femme and Juniper Sprinkles. DJ Mohawk Mike. Vending by Kitty Irreverent (Austin) and Dr. Lucky (Truth or Consequences). Advanced tickets strongly recommended, event expected to sell out! DR. LUCKY’S BLUE REVUE is a grown-up variety show featuring burlesque, variety arts, drag, and dance. 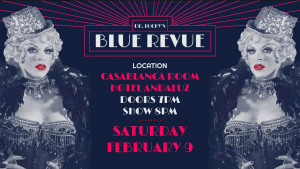 See premiere local, regional, and national death-defying novelty acts, beautiful showgirls, and side-splitting comedy all within the beautiful setting of the Hotel Andaluz’ elegant Casablanca Room. DR. LUCKY’S BLUE REVUE is sure to entertain and tantalize the most discerning patrons seeking a fun night out on the town. Expect the unexpected and buckle your seat belts for a wild ride! Hosted and curated by DR. LUCKY, Award-Winning Female-Female Impersonator hailed a “Big Bad Bold Drag Queen” by Bust Magazine and a “Burlesque Expert” by NY1 & Big Think (New York City). February Shows Texas,New Mexico and So.Cal. Please check out my schedule page for more details!